This sale is for a factory sealed copy of "Beach Boys' Party!" by The Beach Boys. This is from 1965 (1st pressing) on Capitol MAS-2398 in mono. This is in beautiful condition....see all photos that I have posted as they are part of the description. There is 1 small breathe hole in the front shrink & 1 in the back shrink. This features a gatefold cover & comes with the 15 full color fan photos. The songs are "Hully Gully", "I Should Have Known Better", "Tell Me Why", "Papa-Oom-Mow-Mow", "Mountain Of Love", "You've Got To Hide Your Love Away", "Devoted To You", "Alley Oop", "There's No Other (Like My Baby)", "Medley: I Get Around/Little Deuce Coup", "The Times They Are A-Changin'" & "Barbara Ann". Super nice! Please make sure to check out the photos because they tell the story here! Cover : The gatefold cover is in NM- condition with lightly bumped corner tips but otherwise this looks new. The shrinkwrap is clean & tight with a 2" split near the upper left corner. This is still fully sealed & the LP has never been outside the cover & has never been played. *****PLEASE NOTE***** In the photo below, the spot at the bottom of the cover is from the flash of my camera. This is NOT on the cover. Flash only. Vinyl : Presumed to be NM & unplayed since this is still factory sealed. Labels : Presumed to be NM since this is still factory sealed. 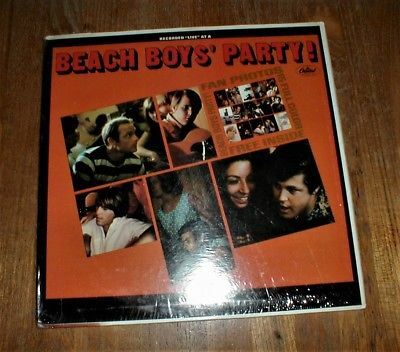 This would make a great addition to any Beach Boys collection. Make sure to check out all of the photos because they tell the story here. Email if you have any questions. Also, please check out the 100's of other items that I have listed in my store Lunkhead Records........where QUALITY is the top priority. Thanks for looking! Grading Information : All records are graded visually under 2-100 watt lights to make sure everthing is noted. Our top priority is to make sure you are totally happy with your purchase. We grade very conservatively in strict accordance with Goldmine standards. Shipping Information : All records are packaged in cardboard record mailers with pads for extra protection. Winners in the US has the choice of priority or media mail. Winners outside the US please email for postage rates. Buy multiple LP's and save on postage - email for quote. Payment Information : I accept Paypal. If you need to use a different form of payment please email me. Payment must be received within 7 days of auction end.